I have now done some more experiments using a combination of walnut hulls and madder root – this time using dried madder root, rather than madder extract. As the photo below shows, sadly no purple or pinks were achieved. So I assume that there must be something in the madder extract that caused the results I described in my last post. Whatever this “something” may be, it would not seem to be present in dried madder root. I simmered the walnut hulls and madder root together for about 30 minutes, then strained off the dye liquid and added the first two samples. 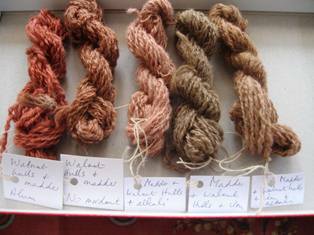 After these had been dyed, I added the three remaining samples. After these had simmered for 45 minutes, I removed them and divided the dye bath into two. I added washing soda to one dye bath and iron to the other. I modified one dyed sample in washing soda and two in iron. I then removed one sample from the iron-modified dye bath, rinsed it well then added it to the dye bath containing the washing soda. Sadly, no purples or pinks were achieved but the reddish-browns are attractive shades.